Shefa deployed the SHEFA-2 fibre optic submarine cable that links the Faroe Islands, Shetland Islands and Orkney Islands to Scotland, in 2007. Shefa is the owner of SHEFA-2. Shefa took over the CANTAT-3 fibre optic submarine cable that links Iceland and the Faroe Islands to Denmark and Germany, in 2012. Shefa is the owner of CANTAT-3. 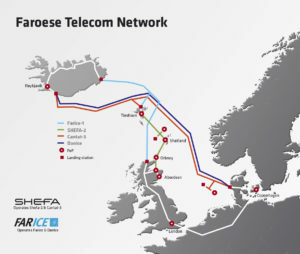 Shefa has access to capacity in the Farice fibre optic submarine cable that links Iceland and Faroe Islands to Scotland. Shefa has access to capacity in the Danice fibre optic submarine cable that links Iceland to Denmark. SHEFA-2 is named after the route on which it is being deployed (SHEtland-FAroes) and succeeds an earlier cable called SHEFA-1 on the same route. SHEFA-1 was deployed from 1971 to 1994, when CANTAT-3 (the fibre-optical submarine cable between Canada and Europe, with branches to both Iceland and the Faroe Islands), was established and was a coax cable with 120 channels, carrying 120 telephone conversations at a time. Establishing the SHEFA-2 cable took less than two years, from the planning of the project in June 2006 until March 2008, when the cable is ready for use. SHEFA-2 runs from Torshavn in the Faroe Islands to Maywick in Shetland, from Sandwick in Shetland and onwards to Ayre of Caira in Orkney and from Manse Bay in Orkney to Banff in Scotland.